Definition of VALUE! 3 Bedroom, 1 bathroom half-duplex in sunny & central location! 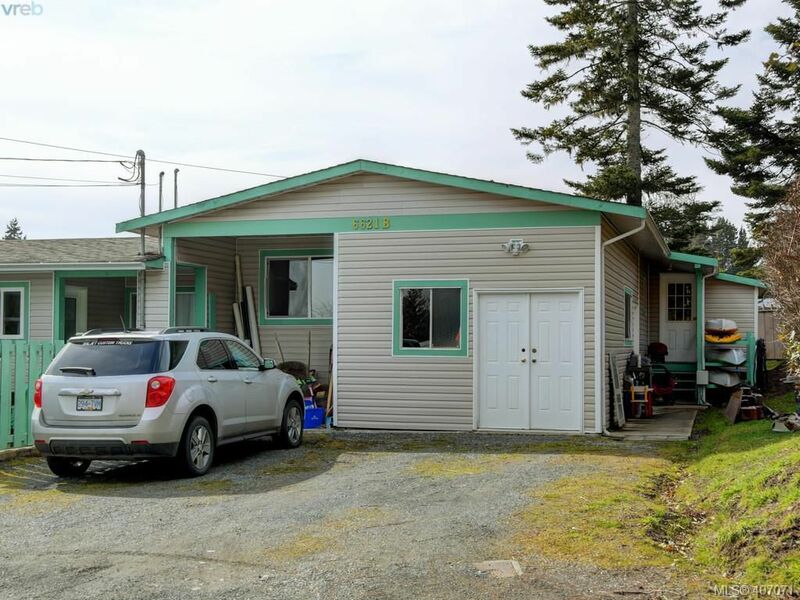 This manufactured-home half-duplex is tucked away down quiet and 'no-thru' Felton Lane and enjoys South-facing ocean views of the Sooke Harbor over to East Sooke. With over 1,200 newly finished sq.ft, this home has plenty of desirable features. Spotless eat-in kitchen with sheet vinyl floors, white appliances & glass tile backslash. Massive living room with laminate floors and views for days! Huge flex room off of living provides for plenty of options: Formal dining? Home office? Family Room? Entry mudroom doubles as great storage space. Three bedrooms providing space for the entire family. 4 piece main bathroom, and closeted laundry space. Entertainment size front deck overlooking the beautifully fenced back yard & ocean views. Large 23 x 12 workshop. Plenty of parking & walking distance to all that Sooke has to offer! Great holding property or an affordable opportunity to enter the housing market! See Schedule of Standard Bylaws. Non conforming strata duplex. SOOKE ROAD, ONTO FELTON LANE, FOLLOW DOWN AND WATCH FOR SIGN ON YOUR RIGHT. TOGETHER WITH AN INTEREST IN THE COMMON PROPERTY IN PROPORTION TO THE UNIT ENTITLEMENT OF THE STRATA LOT AS SHOWN ON FORM 1 OR V, AS APPROPRIATE, Manufactured Home Reg. # 77649.